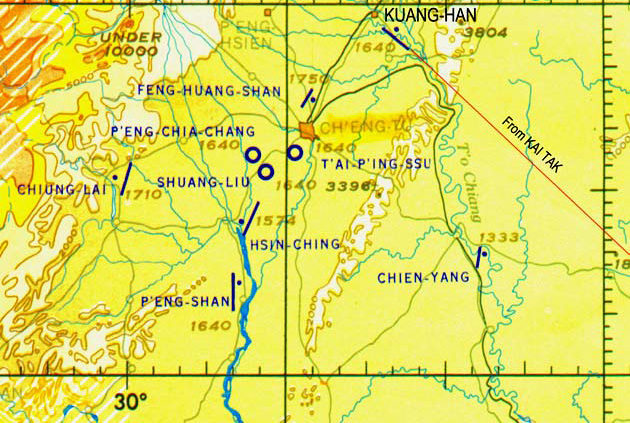 The Two Airfields of Cheng-tu. But as daylight grew the wisps of clouds below him thickened into a solid sheet, and uneasily aware of the rising ground below it, Bohm was forced to claw for yet more altitude. The outside air temperature fell rapidly as height increased and would fall even further as his flight took him north-west. He hoped that thefront he was penetrating would prove narrow and that he would soon come out of it into the cold clear air of the monsoon blowing out of Siberia. He watched the thin ribbon of white forming at the bottom of the windscreen and hunched deeper into his flying jacket. Kiernan shifted uneasily and jabbed an expressive thumb towards the spreading white area on the side windows. However, VR-HDS would not be coaxed any higher - she was not fitted with any form of de-icing equipment. Then Bohm remembered that ice was the salient factor that had led Cosgrove to refuse the flight. 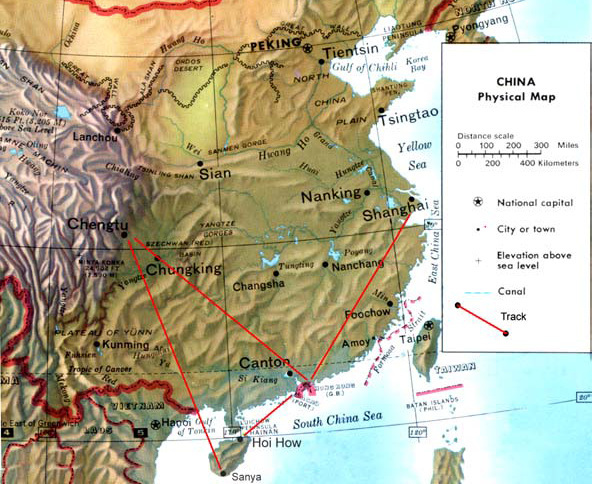 The final miles of MATCO’s charter to Kuang-Han, a satellite field of the city of Cheng-tu. At 9,000 feet Bohm levelled out. The icing rapidly disappeared and, with clear aerials, the volume of the tiny station strengthened in his headphones. The needles of his radio compasses commenced to waver as he closed on the beacon until suddenly they swung through I80 degrees. This indicated that he had just crossed the station. Kiernan clicked the stopwatch - Bohm reduced power to set a rate of descent of 500 feet a minute. Kiernan called the time checks—Forty . . . fifty . . .Go! Bohm violently threw the Cat around on a reciprocal course, for this was no place for textbook gentle procedures. Back to the friendly beacon, one minute on the southerly heading, then around again to the north. North over the beacon . . . stopwatch clicks . . . no room for mistakes . . . round in another tight turn to the south . . . again to the north . . . and this time -yes, it’s breaking. The sheets of stratus are less dense. VR-HDS broke through between layers, and there, confronting their bulging eyes, was a sheer mountain wall where a level plateau should have been. Both pilots reacted immediately. Bohm flung the Catalina into a violent turn to port. Kiernan slammed both throttles and pitch controls as far forward as they would go. The Catalina clawed in a desperate bid for altitude in a tight, too tight climbing corkscrew. Instruments toppled, and Bohm’s only reference was the seat of his pants - which by now were unashamedly wet. Bohm reduced the rate-of-turn. Kiernan, caged and uncaged the artificial horizon several times, finally it settled into its designed function. 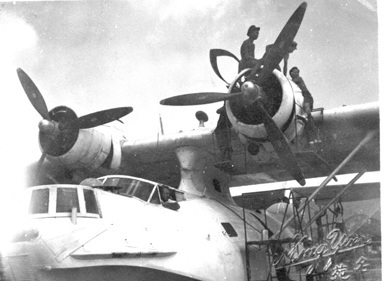 Bohm continued the turn until the Catalina would climb no more. Pacific Overseas Airlines (Siam) Limited, accepted the charter for a second try at Cheng-tu, and, solved the mystery of Captain Bohm’s failure. Its Skymasterenjoyed glorious weather in contrast to that of the lumbering Catalina. In unlimited visibility its crew realised the beacon’s signal came not from the Kuang-han airfield, but from Chiung-lai a strip 30 miles southwest of Cheng-tu. Tucked into a forbidding valley Chiung-lai’s western boundary was a 9,000-foot mountain range. Map of several stories told in this chapter and associated tracks. In an atmosphere other than congenial they departed on the two and a half-hour flight. Only after landing did Ennis realise that the airfield was unserviceable with potholes of unfathomable depth strewing the runway. The ragged soldiers in sight seemed disinterested at the Cat’s arrival.